ABC World News Tonight (titled as ABC World News Tonight with David Muir for its weeknight broadcasts since September 2014) is the flagship daily evening television news program of ABC News, the news division of the American Broadcasting Company (ABC) television network in the United States. Since 2014, the program's weekday broadcasts have been anchored by David Muir. Since 2015, Cecilia Vega has anchored the Saturday editions and Tom Llamas has on the Sunday editions. The program has been anchored at various times by a number of other presenters since its debut in 1953. It also has used various titles, including ABC Evening News from 1970 to 1978, World News Tonight from 1978 to 2006, and ABC World News from 2006 to 2014. It is the second-most watched network newscast in the United States, trailing slightly behind NBC Nightly News in the ratings. In 1967, the inexperienced Jennings left the anchor chair and was reassigned by the news division as an international correspondent for the news program. The newly renamed ABC News was hosted, in succession, by Bob Young (October 1967 to May 1968), and then by Frank Reynolds (May 1968 to December 1970), who was later joined by Howard K. Smith (May 1969 to December 1970). The program expanded from 15 to 30 minutes in January 1967, nearly 3½ years after both CBS and NBC had expanded their evening news programs to a half-hour. Harry Reasoner, formerly of CBS News and 60 Minutes, joined ABC News in 1970 to co-anchor the relaunched ABC Evening News with Smith, beginning that December, replacing Reynolds. In 1975, Howard K. Smith was moved to a commentator role, and Reasoner briefly assumed sole-anchor responsibilities until he was paired with Barbara Walters, who became the first female network anchor when she joined the program in 1976. Ratings for the nightly news broadcast declined shortly thereafter, possibly due in part to the lack of chemistry between Reasoner and Walters. Reasoner would eventually return to CBS and 60 Minutes, while Walters became a regular on the newsmagazine 20/20. Starting in 1973, before the advent of closed captioning, PBS began airing an open captioned version of the ABC Evening News that was distributed to various public television stations throughout the U.S, airing mostly in late-night timeslots five hours after the original ABC broadcast. This version was produced by Boston PBS station WGBH-TV, which provided the captions and repackaged the broadcast with additional news stories – some of which were of special interest to the hearing impaired – as well as late-news developments, weather forecasts, and sports scores inserted in place of commercials. The practice continued until 1982, when real-time closed captioning was first introduced in the United States by the National Captioning Institute. Always the perennial third in the national ratings, ABC News president Roone Arledge reformatted the program, relaunching it as World News Tonight on July 10, 1978. Reynolds, who was demoted when the network hired Reasoner, returned as lead anchor, reporting from ABC News' Washington, D.C. bureau. Max Robinson – who became the first African American network news anchor upon his appointment on the program – anchored national news from the news division's Chicago bureau. Peter Jennings, who also returned for a second stint, reported international headlines from the division's London bureau. In April 1983, Reynolds became ill, leaving both Jennings and Robinson to co-anchor the broadcast until his planned return; however, Reynolds would die three months later on July 20, 1983 from bone cancer. A rotation of anchors hosted the program until August 9, 1983, when Jennings became the sole anchor and senior editor of World News Tonight. The program began broadcasting from New York City on a regular basis in September 1983, at which time Bill Owen replaced Bill Rice as announcer for a year. In September 1984, the program was renamed World News Tonight with Peter Jennings in order to reflect its sole anchor and senior editor. Robinson left ABC News in 1984, after stints of anchoring news briefs and the weekend editions of World News Tonight; he died from complications of AIDS in 1988. With Jennings as lead anchor, World News Tonight was the most-watched national newscast from February 27, 1989, to November 1, 1996, but from then on until February 2007, it placed second behind its main rival, NBC Nightly News. 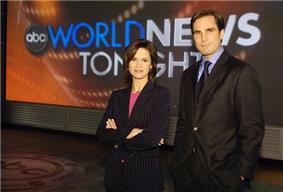 Elizabeth Vargas and Bob Woodruff, co-anchors of World News Tonight. The broadcast was produced live three times per day – the regular live broadcast for the Eastern and Central Time Zones, plus separate broadcasts for the Mountain and Pacific Time Zones. In addition, a live webcast, World News Now (which, incidentally, carried the same title as ABC's overnight news program), with a newsbrief and a preview of that evening's broadcast, was launched. The webcast aired live at 3:00 p.m. Eastern Time on ABC News Now and ABCNews.com, and can be viewed throughout the rest of the day after 4:00 p.m. Eastern Time. 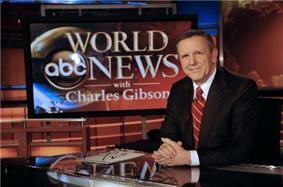 Charles Gibson, anchor of World News with Charles Gibson. In the February 2007 sweeps, World News with Charles Gibson achieved the number-one spot in the Nielsen ratings among the network evening news broadcasts, overtaking NBC Nightly News, marking ABC News's first victory since the week Jennings died in August 2005. Starting in April 2007, Gibson announced that the Monday broadcasts of World News would become expanded editions, allowing only one commercial interruption to feature extended special segments on global warming. Long-time ABC journalist and anchorwoman Cynthia McFadden, Dan Harris, Paula Faris and Byron Pitts (with the exception of McFadden, who left ABC News in August 2014, most of these anchors/correspondents have also served as substitutes following Muir's appointment as anchor of the program). David Muir became the weekday anchor and managing editor of the program on September 1, 2014, while retaining his duties as co-anchor of 20/20. However, George Stephanopoulos assumed the news division's Chief Anchor position that had traditionally been assigned to the anchor of World News. Following the departure of Diane Sawyer, the title of the program was also silently rebranded back to World News Tonight for the first time since 2006. Primary substitutes are George Stephanopulos, Amy Robach, Tom Llamas, and Elizabeth Vargas. World News Tonight continues to focus on a more tabloid "infotainment" approach similar to Good Morning America, with the "Instant Index" feature of viral videos, a cable news-style graphic continuously showing the story being discussed, animation graphics, and a faster pace. World News Tonight was the most watched network evening newscast for the week of March 30, 2015. This marked the first time in seven years that the program finished at #1, beating out NBC Nightly News in all categories. Its supporters argue that World News Tonight's ratings dominance is as the result of producers figuring "that a lighter approach may be a key to appealing to younger people", as the program continues to dominate among the 25-54 demographic seen as most advertiser friendly. ABC first attempted an early evening weekend newscast in July 1975, when it debuted a Saturday bulletin that was anchored by Ted Koppel. The broadcast, however, was not carried by many stations, and it was cancelled about a year later. Three years later, after the flagship weeknight broadcast became World News Tonight, the program expanded to six nights a week with the premiere of World News Sunday on January 28, 1979, and to a full seven days with the restoration of a Saturday newscast (World News Saturday) on January 5, 1985, years after NBC and CBS had each launched their own weekend evening news programs. These editions added the word "Tonight" to the program title in the mid-1990s, further unifying it with the weekday editions, and in the mid-2000s, their respective names were shortened uniformally to World News Tonight to correspond with those broadcasts. However, the original names were restored on July 19, 2006, concurrent with the retitling of the weekday broadcasts, but the opening title sequence displayed the name as World News for both the Saturday and Sunday editions. Prior to 1975, the only network newscasts that ABC stations broadcast on weekends were 15-minute late-night updates on Saturdays and Sundays, seen on many affiliates in tandem with the local stations' own 11:00/10:00 p.m. newscasts, although some stations opted to tape-delay the network updates until immediately before their regular sign-off time (rival CBS also offered a 15-minute Sunday night bulletin during the 1970s and 1980s). Because of declining affiliate interest (in part because of the proliferation of 24-hour cable news channels such as CNN) and low viewership, ABC discontinued the late-night weekend reports in September 1991. Some former anchors of the weekend news broadcasts include Sam Donaldson (Sunday edition, 1979–1988), Kathleen Sullivan (Saturday edition, 1985–1987), Charles Gibson (Saturday edition, 1987–1988), Forrest Sawyer Carole Simpson (weekends, 1988–2003), Aaron Brown (Saturday edition, 2006-2007), Terry Moran (Saturday edition, 2004–2005), Bob Woodruff (Sunday edition, 2004–2005), Dan Harris (Sunday edition, 2006–2011) and David Muir (Saturday edition, 2007–2011; Saturday and Sunday editions, 2011–2014). Muir, who had taken over World News Saturday in 2007, took over the Sunday broadcast in 2011, ending the practice of using separate anchors for the Saturday and Sunday editions of the program, with ABC renaming both broadcasts as ABC World News with David Muir as a result. David Muir anchored the weekend program until he took over the weekday broadcast in September 2014. The program returned to using separate anchors for the weekend broadcasts afterward, with Cecila Vega being named anchor of the Saturday broadcast and Tom Llamas named anchor of the Sunday edition in February 2015. Some ABC affiliates air the Sunday edition of World News Tonight at 6:00 p.m. Eastern and Pacific Time (5:00 p.m. Central and Mountain) – one half-hour earlier than the weekday broadcasts. The program faces clearance issues for its weekend editions like those faced by CBS and NBC, as some affiliates (such as WFAA in Dallas-Fort Worth and WSB-TV in Atlanta) opt to pre-empt the Sunday edition. The weekend editions of World News Tonight may occasionally be abbreviated (with segments and stories that were originally scheduled to air being excised to account for the shortened running time) or preempted outright due to sports telecasts that overrun into its timeslot or occasionally air immediately following the program (the latter pre-emption situation commonly affects stations in the Pacific and Mountain Time Zones); this is particularly common during the fall season, as the Saturday broadcast is usually pre-empted by ABC's college football coverage and during the winter and spring, when the Sunday broadcast is sometimes delayed or pre-empted due to overruns of the network's NBA telecasts. ABC News programs, including ABC World News Tonight, are shown for several hours a day on the 24-hour news network OSN News in Middle East and North Africa. In the United Kingdom, the program is shown Tuesday through Fridays at 1:30 a.m. on BBC News, a channel that is frequently simulcast by BBC One at this time, meaning the program was broadcast on analogue terrestrial television in many parts of that country until the digital transition. The newscast is aired on a delay, in part because of the need to remove commercial advertisements, as the BBC's domestic channels operate as commercial-free services, replacing them with promotions for different BBC News special programs. The program was replaced by Asia Business Report and Sport Today on June 14, 2011, but later returned to the channel on August 20, 2012. It is also available on the BBC's on-demand service BBC iPlayer for 28 days after its domestic broadcast. ^ Glen Dickson (August 25, 2008). "Exclusive: World News Kicks Off HD Expansion at ABC — World News with Charles Gibson, Nightline to Begin Broadcasting in 720p HD Aug. 25". ^ a b "'"Meet David Muir, the Man Taking Over ABC's 'World News. ^ Chris Ariens (September 24, 2013). "Evening News Ratings: 2012-2013 Season". ^ "A Brief History of Captioned Television". ^ "When would Diane take over WNT". ^ "Charlie Gibson WNTS Temporary Permanent Replacement". ^ "World News Tonight"Gibson Takes Over . ^ Joe Garofoli (May 24, 2006). "ABC News Turns to Morning Host to Take on Couric". ^ "Charles Gibson: Your Trusted Source". ^ a b "ABC Brings ‘Tonight’ Back to ‘World News’". ^ "Evening News Ratings: Williams Tops Gibson In November Sweeps". ^ Brian Stelter; Bill Carter (December 1, 2009). "ABC Plans Low-Key Handoff for ‘World News’". The New York Times. Archived from the original on December 4, 2009. Retrieved December 30, 2009. ^ Chris Ariens (December 22, 2009). "A Much Cleaner Job for Mike Rowe: The Voice of 'World News with Diane Sawyer". ^ "ABC Unveils New 'World News' Set". ^ Julie Moos (October 18, 2011). "Tyndall: ABC spends half its evening newscast on ‘soft news’". ^ David Bauder (October 17, 2011). "New life in television's evening news". ^ "'"Diane Sawyer stepping down from ABC's 'World News. ^ Diane Sawyer (August 27, 2014). "See you tonight for my last night anchoring @ABCWorldNews – great adventures ahead !". ^ World News" Wins Among Adults 25-54 and Adults 18-49 with Largest Margins Since 2007""". ABC News. September 2014. ^ Gary Levin (June 25, 2014). "'"ABC News changes mark a big 'turning point. USA Today. ^ Andrew Tyndall (October 31, 2014). "Bait-and-switch teases, cellphone videos and even Hollywood special effects are behind the rise of David Muir at ABC, writes top news analyst Andrew Tyndall". ^ Paul Farhi (June 1, 2015). "How ABC’s ‘World News Tonight’ became a ratings winner". ^ "きょうの世界". NHK. March 28, 2011. Retrieved April 28, 2011.